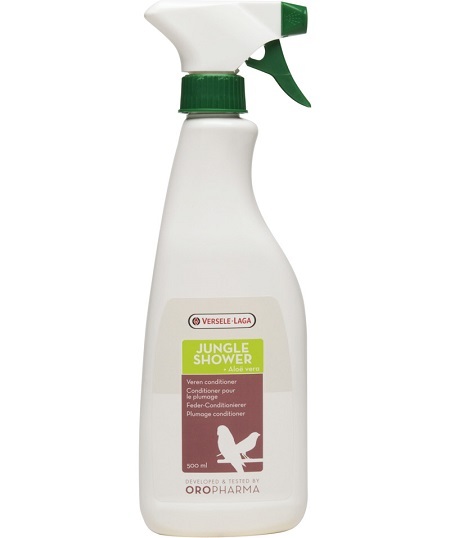 Oropharma Jungle Shower is a spray made from aloe vera for brilliant plumage and healthy skin. This care product cleans the feathers, restores the moisture level of the skin and feathers, reduces the loss of feather powder and helps keep the skin healthy. Aloe vera is a plant that contains more than 200 different active substances, including mono- and polysaccharides, enzymes, minerals, amino acids and many bioactive substances that are very important for keeping birds feathers and skin in excellent health. Aloe vera is also known for its great moisturizing properties that restore the natural moisture level of the plumage and strengthen the feathers without damaging their natural fat layer.